Intervista Institute's faculty includes leading experts and practitioners from around the globe. Learn more about our brain trust. Already well-known for its CIO development programs, over 9000 executives and change agents have chosen Intervista's programs for strategic advancement. 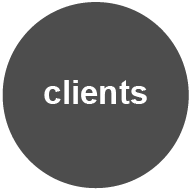 See a partial list of clients. Co-founder of the Intervista Institute, Teresa Di Cairano is the research and editorial lead for Intervista's executive education and knowledge media programs. For the last 20 years, her areas of focus include the role of emerging information technologies, design thinking and innovation leadership as strategies for organizational change. Teresa is currently leading the development of innovationcultures – a new web-based executive program. Leveraging her knowledge in entrepreneurship & innovation, media and learning, Teresa creates insightful programs targeted at executives, strategists and change agents. Her prior experience as a communications consultant to high tech clients includes program and creative direction of numerous projects in web, video and print. She has graduated from Concordia University in Communication Studies. Co-founder of Intervista, Robert Mazerolle leads corporate planning, strategic development and new ventures. Over the course of 30 years in business, he has been an energetic entrepreneur leading publishing ventures aimed at high level executive audiences. Robert is focused on business development and positioning of Intervista's thought leadership. Currently, Robert is co-developing the innovationcultures program, an on-line knowledge service focusing on the urgent need for government and enterprise renewal. Robert's experience includes strategic CIO communications and research for the IT industry including consulting engagements with DELL, Sun, Compaq and IBM. He has graduated from the Nova Scotia College of Art and Design. With a background in Computer Science (Computer Games option) as well as Micropublishing and Hypermedia, Rohan leads prototype development for Intervista's design studio services. He also provides creative and production support for Intervista Institute's Web-based communications and innovation learning programs. In between, Rohan moonlights as an independent game developer creating some pretty cool casual games. Mick is a research consultant with Intervista Institute. He is also a consultant in researching and quantifying the skills and competencies required for complex technical jobs. Mick performed both technical and managerial roles with IBM Canada in manufacturing, marketing, and software development. After leaving IBM with 26 years of service, Mick moved, as an independent consultant, into the corporate education field as a technical educator, course and program developer, and adult education consultant. He is currently researching the emerging disciplines of design thinking and innovation leadership. Mick has a Bachelor and a Masters degree in Physics. He also has significant volunteering experience. Susie Monette has been with Intervista for over 10 years as our customer service lead. Whether your requirements are for a large team or yourself, Susie is there to ensure smooth logistics and a great learning experience.